Minnesota Lynx star Seimone Augustus didn't hide her displeasure with police in suburban Minneapolis earlier this week when she took to Twitter to criticize what she felt was an unfair traffic stop. After talking with the police chief for Roseville, Augustus said Wednesday that she is ready to move on and focus on preparing for the WNBA Finals. Augustus was pulled over on Monday October 8 near the Rosedale Shopping Center for having an air freshener hanging from her mirror. That violates a state statute. Augustus, who is black and was driving a car with license plates from her home state of Louisiana, appeared upset because she thought it was a case of racial profiling. A Roseville police spokesman says the stop had nothing to do with race and added that Augustus was only issued a warning. The Lynx are going for their second straight WNBA title, with Game 1 scheduled for Sunday night against either Indiana or Connecticut. 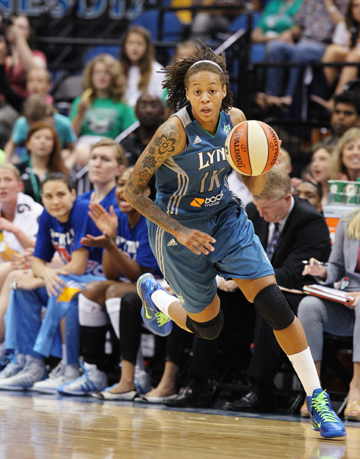 Lynx coach Cheryl Reeve said she supported her leading scorer speaking out when she thought she was wronged. “It shines light on a bigger problem, which is racial profiling,” Reeve said.